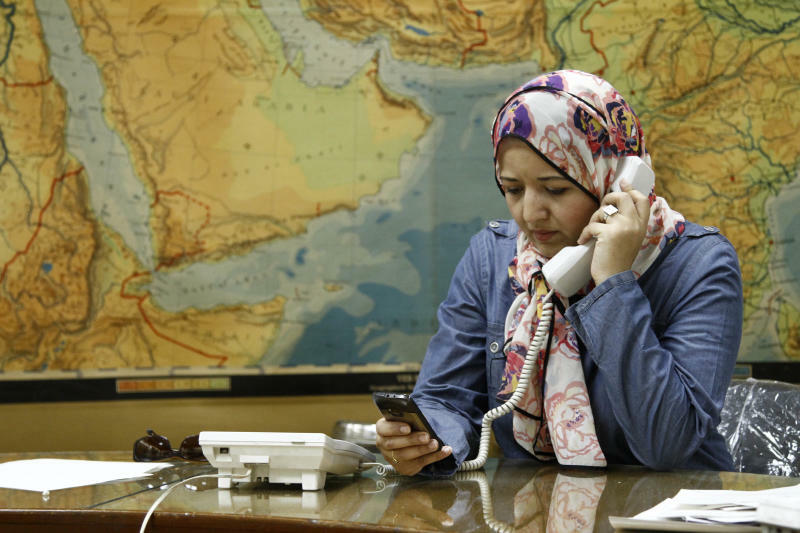 CAIRO (AP) — When autocrat Hosni Mubarak fell after popular protests in 2011, journalist Sabah Hamamou hoped for change at her newspaper, Al-Ahram, the state-owned media flagship with an editorial line firmly controlled by the regime. Hamamou and some of her fellow journalists held demonstrations, issued petitions and pressed editors for the paper to break from state dictates and adopt independent, objective coverage. Change never came. First, the military rulers who took over after Mubarak tightly controlled the paper. Once Mohammed Morsi became president, his Muslim Brotherhood stepped in and pushed coverage their direction. "What happened was they just put in their people in Al-Ahram and other state institutions, and nobody tried to reform the institutions themselves," Hamamou said. "The saying goes if you are confused about who is ruling Egypt, just look at the headlines of Al-Ahram." Now Hamamou is dismayed to see the paper and other state media unquestionably embracing the military after its coup that ousted Morsi on July 3, following protests by millions around the country demanding his removal. It's not only state media. Independent TV stations and newspapers have also enthusiastically backed the military and its crackdown on the Brotherhood, which included shutting down four Islamist TV stations. Their full-throated support reflects how convinced they became over Morsi's year that the Brotherhood were fundamentally anti-democratic and intertwined with violent extremists. Independent stations thrived after Mubarak's fall, usually touting their advocacy for democratic principles. Many, including several owned by wealthy opponents of the Islamists, were deeply critical of Morsi. They raised the alarm over signs of the Brotherhood monopolizing power, infringements of press freedoms and civil liberties, violent hate speech from his hard-line allies — and over the killing of protesters by police under his administration. But in recent days, they have been uncritical of acts by the military. After more than 50 pro-Morsi protesters were shot to death by security forces in clashes Monday, a star announcer on independent CBC TV, Lamis Hadidi — once a spokeswoman for Mubarak's 2005 re-election campaign — cautioned viewers not to think of the dead as "martyrs." Instead, she blamed the Islamists for "a new Brotherhood massacre." Egypt's media landscape has long been sharply partisan. The Brotherhood's TV station and others run by their ultraconservative Islamist allies — now off the air — were whole-heartedly in Morsi's camp. During the past weeks, the Brotherhood's party has posted pictures of children killed in Syria's civil war, presenting them as Egyptian Brotherhood dead. Al-Jazeera TV, owned by Brotherhood ally Qatar, also was accused of strongly pro-Morsi coverage. Since protests against him began, the station has covered mass rallies in his support more extensively than those against him — the mirror image of some anti-Morsi stations' coverage. Six staffers quit accusing it of bias. "At the end of the day, as much as journalism is supposed to be about a lack of bias, the opinion journalism model has taken over the media," said Mahmoud Salem, an Egyptian writer and political analyst — and sharp critic of the Brotherhood. "Everyone wants to be a cheerleader for his or her team." Now that has turned into lashing out at the other team as well. During a military press conference Monday, a journalist from the state news agency stood up and demanded Al-Jazeera reporters be excluded. The station's reporters walked out to chants of "Out! Out!" from others in the crowd. They also applauded repeatedly in reaction to the military spokesman's statements. Earlier, security forces raided the offices of the local Al-Jazeera affiliate, detaining its staff briefly and holding its manager and chief engineer for several days. On Friday, Al-Jazeera reported that a correspondent and a three-member camera team were detained by the military while filming in the city of Suez and were being questioned. A senior police official late last week also ordered The Associated Press to stop providing the station live television footage from Tahrir Square. 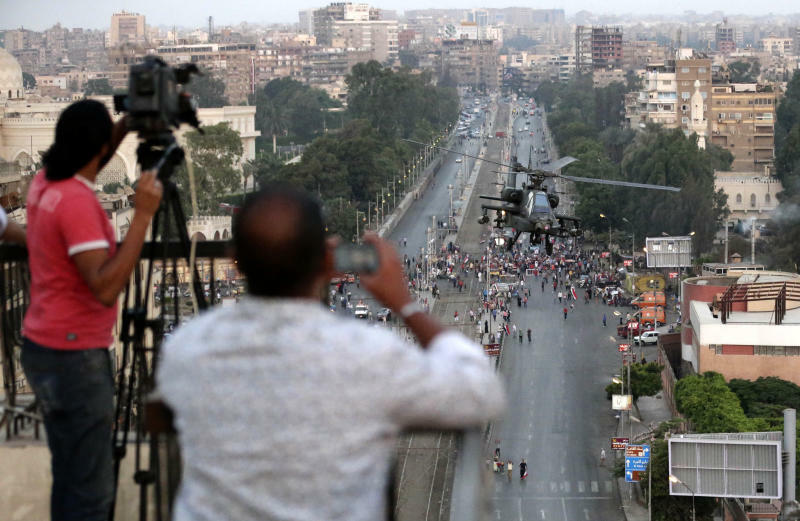 The AP dispatched two executives to Cairo to protest the suppression. After a series of meetings with senior government officials, who stressed the shutdown was not official government policy, the AP live video service to Al-Jazeera was restored Wednesday. In a statement, Al-Jazeera said it was being targeted by a "crackdown on information" and denied bias. "We've always given all sides of opinion airtime on Al-Jazeera, it's our mantra," it said. "Large sections of the Egyptian media object to this open-minded ethos." Atlanta-based CNN has also come under criticism and its journalists have been harassed because many in the anti-Morsi camp accused it of a pro-Brotherhood bias after it called his ouster a coup. Protesters have carried signs against the network in Cairo's Tahrir Square. "What specifically brought attention to CNN is that we called this a coup early on," said Tony Maddox, director of CNN International. "Some people don't want it described as that, but I'm afraid that is what it is and we will call it as we see it." Lina Atallah, editor-in-chief of a new online news site Mada Masr, said there was increased pressure on journalists to toe the line. She pointed to coverage of the protester killings on Monday, which repeated the military's version of the violence with few independent witness accounts. "What's scary about this time around in the media performance is that there is much more agenda-setting from above," she said. Media emphasizing independent reporting struggle for funding in a landscape dominated by outlets owned by the state or by well-funded movements like the Islamists or by businessmen with an agenda. Mada Masr is one attempt to create such an outlet, founded by a group of young journalists. Publisher Hisham Kassem is attempting another, with his plans for a new independent daily, Al-Gomhouriya Al-Gadida, or the New Republic. He told AP he has to fend off offers from old regime sympathizers on one hand and Brotherhood members on the other to buy it up and use it as a platform for their views. During Mubarak's last years in power, Kassem helmed Al-Masry Al-Youm, one of the first independent papers that avoided the sycophancy of the state press and the unreliable shrillness of opposition party newspapers. In state media like Al-Ahram, the ruler of the day stocked the paper with loyalists to keep it in line. Under Mubarak, Al-Ahram's chief was a close associate of the president. State security often weighed in on its and state TV's coverage. Al-Ahram's newsroom was notorious for nepotism and favoritism and was influenced by the interests of the sprawling Al-Ahram conglomerate, which includes a large advertising agency. Hamamou, a 20-year veteran at Al-Ahram and a reporter for the economic section, says she has been appalled by the unprofessionalism. "There are no lines between editorial and advertising pages," the 38-year-old said. "According to the documents we got after the revolution, many journalists got commissions (to write pieces) from the advertising department — it's against journalism ethics." With Morsi's inauguration and a freely elected president in place, many in the staff expected reform. They were disappointed when the Brotherhood appointed a new chief editor they said had little experience, who turned coverage in the Islamists' favor. Younger journalists staged a sit-in, complete with a tent, in the paper's lobby and demanded his removal. The new editor, Abdel-Nasser Salama, fired some reformists appointed since Mubarak's fall and brought back editors who had been pushed into retirement. Still, the Brotherhood was less successful than the military in dominating the state media. There were flashes of resistance. In one case, a presenter on state TV ended his newscast by sarcastically thanking the presidency for providing the material. Another pulled out a shroud on air and pronounced she was ready to die rather than obey Brotherhood directives. With the military now in charge, these qualms have disappeared and state media resumed lockstep support for those in charge. Al-Ahram editors saw the direction the wind was blowing even before Morsi's exit. On July 1, the day after the first massive rallies against the president, the paper's front-page blared, "Morsi: Quit or Be Forced to Quit." Hammamo and other staffers saw that as a sure sign that the military, about to make its move, had told the paper's management to fall in line. "The editor-in-chief wouldn't have put this if he didn't have direct information," she said. "It is human nature," she said. "They will be with whoever is the winner."